To those that I haven’t had a chance to see yet, Happy New Year! Yes, I know that we are three weeks in, but given that there are 49 weeks left I say we are still new. I hope your 2019 is off to a wonderful and rousing start. For me personally, 2019 seems to be a year of transition and newness. For the first time in five years I will not be attending school. I will admit it was a little bittersweet when I dropped my wife off for classes Monday and realized I no longer had to worry about going (Ashley did mention that I could come back but I don’t miss it THAT bad). School had been such a big part of my life. It was a life changing moment not only for me, but my entire family, when I decided to go back to finish my degree. Now that I am done with school, I find myself with some extra time on my hands (I no longer have to stay up late writing papers) that I need to fill. A way to fill that space in my life is to spend time establishing and cultivating relationships with those around me. Here at CCC it is our primary goal to build meaningful relationships. In fact, we state that in our organization’s mission statement. 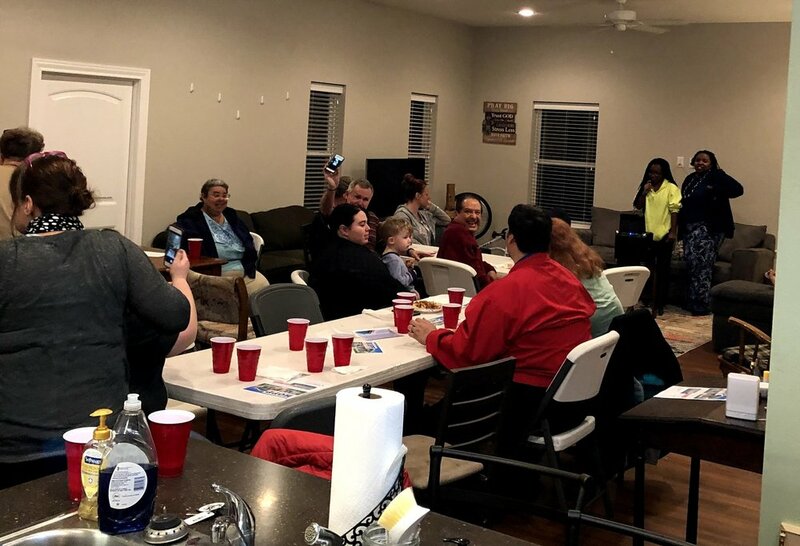 One of the ways we promote and connect people is through our monthly gatherings. Once a month we hold a neighbor interest dinner in the College Heights Neighborhood and the North Park Neighborhood. These dinners our held at the Friendship House in each neighborhood. The gatherings are a time for neighbors to come together and share a meal, conversation, and hopefully a few laughs. The Neighbor Interest Dinner in the College Heights neighborhood is held at my house every second Monday. At our dinners we usually invite someone to talk and share their expertise with us. In the past we have had people from the city of Abilene share with us about our city. We have also heard helpful information from people such as plumbers and mechanics. However, every now and then we will go off script and have an evening of fun. Such was the case this past Monday, January 14th. The evening was dedicated to karaoke. At this dinner we had 29 neighbors and friends gather together to sing songs from Elvis Presley to Meghan Trainor. One neighbor blessed us with a screaming heavy metal anthem that was enjoyed by all. If you are like me and want 2019 to be more about meaningful relationships, then get to know those close to you; like the people that live next door. Be intentional about meeting and getting to know them, and maybe host your own karaoke night. If you happen to live in the College Heights or North Park neighborhoods, join us at one of our meals. I promise you will enjoy a good meal and if I get to sing Johnny Cash again, you will have a good laugh as well. See more photos from our College Heights Neighborhood dinners on our Facebook page.